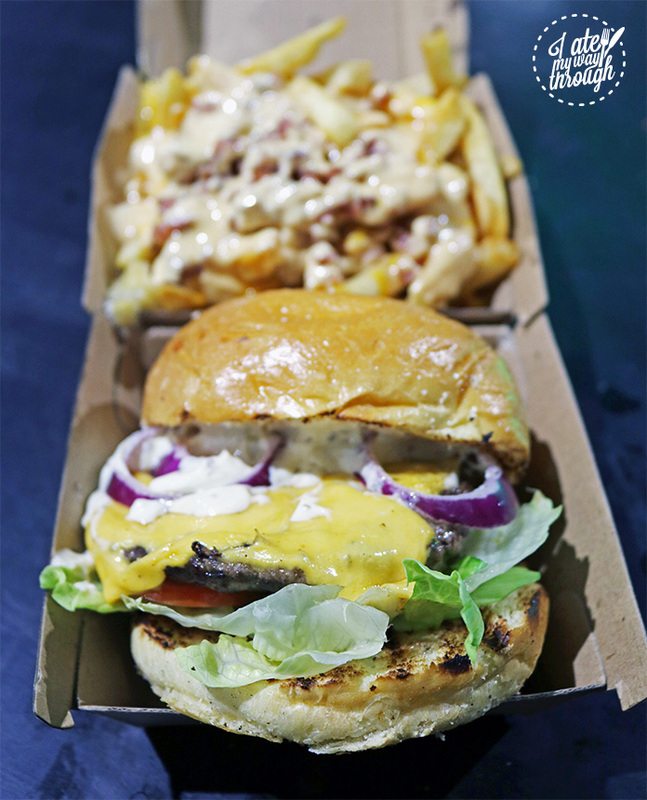 Find yourself in food truck heaven at Paddy’s Night Food Markets in Flemington. With some big names making appearances like 2 Smoking Barrels, Maverick Wings, Mickey Chews and Chur Burger trucks and the Happy as Larry pizza truck you’re sure to not be left hungry or without some amazing eats. Running every Saturday night from 6pm until late, the vans roll in and get their stoves burning up to bring you some of the best street eats around. You know it’s good too with the crowds that come in droves in search of the tastiest bites. With the array of trucks of offer, the choices are dizzying but my logic was to follow my nose and the crowds. My first truck stop on my culinary road trip was at the crowd pleasing Dirty Bird. I ordered the Southern style chicken wings ($16) to kick start my market experience. The wings here are some of the best I’ve ever had and they’re huge, so one box was great to share with a friend or could have suited one person as a meal. I ordered the mild and they were anything but lacking in amazing flavours, with a little kick still that could be curbed with the side serve of pickles and slaw. I know now why the line was so long for these crowd favourites, #worthit. 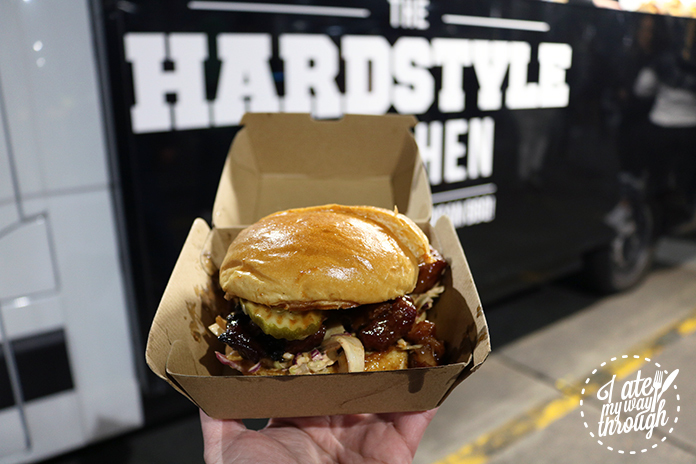 Hardstyle Kitchen’s Pork Belly ‘Burnt End’ Roll ($15) caught my eye after I saw them pull out some good looking barbecued meat from their barbecue pit next to their truck. Nothing is more tempting that fresh barbecue so I had to give it a try! 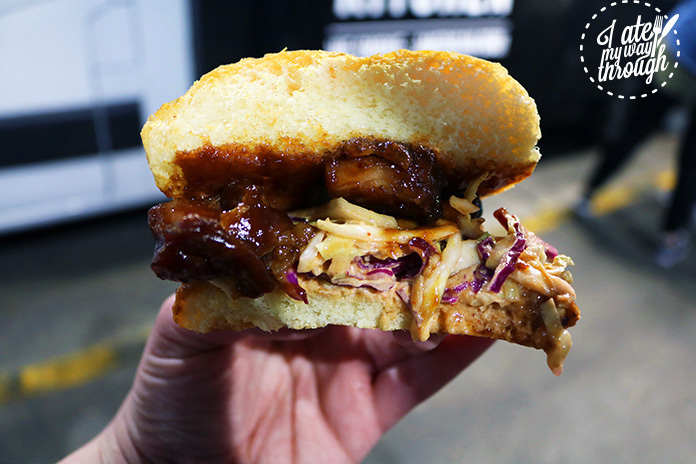 The triple wood smoked pork pieces were succulent but oh so flavoursome teamed with the awesome honey bbq sauce, pickles and sriracha slaw on brioche. I’d be happy to enjoy another one of these. Wash it down with an A&W Root Beer ($3) for that all American experience. I’d been looking at the G-Dup Burger Truck for their ingenious Nutty Bae burger ($14) because the sound of Nutella combined with bacon sounds like heaven to me. I fell prey to the quicker crowds unfortunately, as they’d already sold out of them. However, good things still come to those who wait, I tucked into their Caveman burger ($12) and was left with a grin on my face. What makes this burger really special is the truffle mayo and a really well cooked patty. Team it with the loaded fries ($8) with bacon, cheese and G-dup special sauce and you’ll be nursing a food baby for a while. Dessert options are in abundance too. 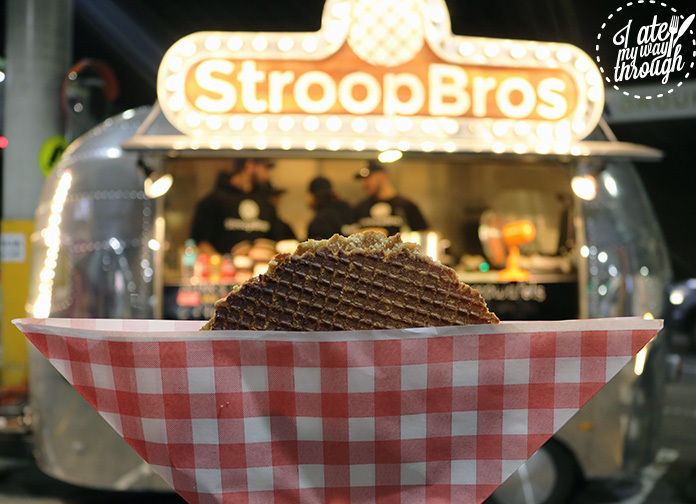 I opted for a stroopwafel ($6) and a choc chip ice cream sandwich ($9) from StroopBros. These Dutch delights are sure to leave a sticky, sweet smile on your face with hot, fresh waffles held together with caramel which are insanely popular. The ice cream sandwiches are also great if you’re after a classic treat to remind you of your childhood. Enjoy it with a coffee from Pull’n Shots, they use a great blend by All Press Espresso and it’ll definitely round off your meal. So if you’re hankering for something a little different or looking for a new weekend haunt make sure to check out Paddy’s Night Food Market on a Saturday night. 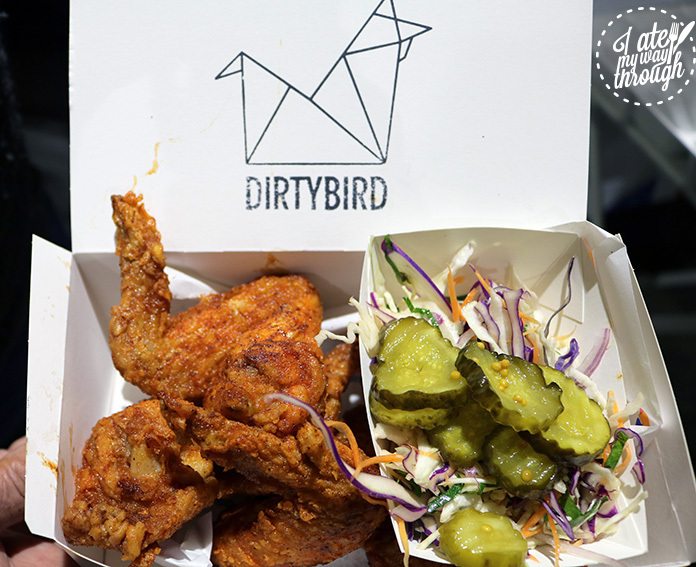 With the trucks changing around every week no two weeks will be the same – meaning you get all the great, varied food options from some of Sydney’s best.